WASHINGTON, D.C. -- Seven years after the worst financial crisis in the U.S. since the Great Depression, the percentage of Americans expressing "a great deal" or "quite a lot" of confidence in banks remains low (28%), but this is higher than their 21% confidence in 2012. About half of Americans (45%) have "some" confidence in banks, while 26% have "very little" confidence or none at all. These results are based on a June 2-7 Gallup poll that included Gallup's latest update on confidence in U.S. institutions. 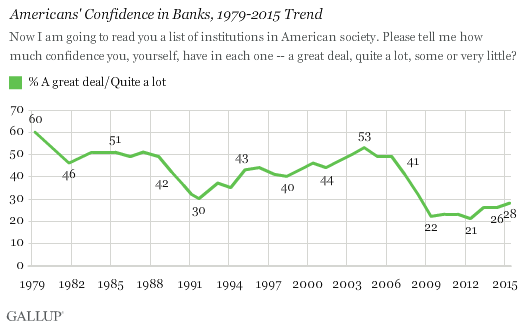 Like confidence in nearly every other major institution Gallup has tested, Americans' current confidence in banks is below the 1979-2015 average of 40%. But banks' rapid loss of credibility between 2006 and 2009 is the product of more than just a general trend across all institutions. In fact, few institutions have seen such a steep drop in confidence in recent years. In 2004, confidence in banks stood at 53%, near its historical high, amid a lending boom. By June 2009, after that boom went bust, confidence fell to 22%. Three years later, in June 2012, it stood at 21%, as a seemingly endless list of scandals and allegations of misconduct -- including a concerted effort by some banks in the U.S. and abroad to manipulate a benchmark interest rate -- dogged the financial industry. It has recovered only slightly since then. Banks have recovered from a precipitous drop in public confidence before. The Savings and Loan crisis combined with the recession of the early 1990s saw confidence in banks tumble from 51% in 1987 to 30% in 1991. As the economy healed, confidence climbed its way back to the 53% reading in 2004. 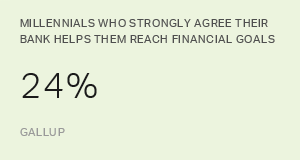 Americans who express satisfaction with the way things are going in the U.S. are more likely than those who are dissatisfied to say they have confidence in banks, by 39% to 24%. That is part of a broader pattern evident in the data, in which those who are satisfied with national conditions generally tend to express greater confidence in most institutions. In absolute terms, no major political group is especially positive on banks in terms of confidence, though Republicans are slightly more likely to say they have confidence in banks (35%) than are independents (25%) or Democrats (27%). But Democrats are not quite as cool to banks as they were in 2012. That year, fewer than one in five Democrats (19%) had a great deal or quite a lot of confidence in banks, versus today's 27%. Republicans' views have been more static, with 34% expressing this level of confidence in 2012, similar to their 2015 views. Even as some Democratic presidential candidates pledge to break up the largest banks, Democrats have seen a marginal recovery in their views of banks. In many ways, the consequences of the 2008 financial crisis continue to haunt the banking industry's image -- even as the economy continues to recover from the crash, and nearly all of the government-supplied bailout funds known as TARP have been repaid, according to the Treasury Department. These facts notwithstanding, confidence in banks has seen only slight upward movement from the low levels first encountered in 2009; a more complete recovery of the industry's image with the public has been elusive. Memories of the crisis, in conjunction with a more recent string of scandals, have likely limited the rehabilitation of banks' image with the American public. But the S & L crisis of the late 1980s provides some hope for industry leaders: The fallout from the crisis led to plunging confidence levels among Americans, but trust was eventually restored, likely related to strong economic growth of the 1990s and the greater accessibility to credit in the 2000s. This example suggests banks could restore some of their lost goodwill with the American public, but currently there is little evidence that this is occurring. Historical data on these measures are available in Gallup Analytics. Results for this Gallup poll are based on telephone interviews conducted June 2-7, 2015, with a random sample of 1,527 adults, aged 18 and older, living in all 50 U.S. states and the District of Columbia. For results based on the total sample of national adults, the margin of sampling error is ±4 percentage points at the 95% confidence level. All reported margins of sampling error include computed design effects for weighting. Americans' confidence in U.S. banks remains at 26%, up from the record low of 21% in 2012, but still well below the 41% found prior to the Great Recession. Confidence in small business continues to exceed confidence in big business. Americans' confidence in U.S. banks improved to 26% this year, up from the record-low 21% in 2012. Americans are now as likely to have a great deal or quite a lot of confidence in banks as they are to have little or no confidence. Banks play an essential role in economic growth and job creation. This is why restoring Americans' confidence in banking is essential to any effort to revive the U.S. economy. Learn how banks can optimize their channel experiences to align them with millennials' expectations.